1.1 What happens if you view the world as a graph? What happens if you view the world as a graph? It depends on your view point. The first point of view you choose might be your starting point. If you look from a starting point in time you might end up with starting your analysis of the world with the big bang if you are a physicist or from the Genesis if you look from a religious point of view. If you are more pragmatic you&apos;ll look from where you are right now. A variable holds a value. E.g. 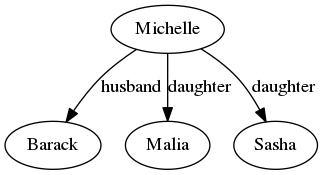 The variable "name" might hold the value for one of the Obama family members. To record interesting details about individual things the Record was invented. There is one record for each individual (thing). "I should talk now about Phaedrus&apos; knife ... The application of this knife, the division of the world into parts and the building of this structure, is something everybody does. All the time we are aware of millions of things around us - these changing shapes, these burning hills, the sound of the engine, the feel of the throttle, each rock and weed and fence post and piece of debris beside the road - aware of these things but not really conscious of them unless there is something unusual or unless they reflect something we are predisposed to see. We could not possibly be conscious of these things and remember all of them because our mind would be so full of useless details we would be unable to think. From all this awareness we must select, and what we select and call consciousness is never the same as the awareness because the process of selection mutates it. We take a handful of sand from the endless landscape of awareness around us and call that handful of sand the world. Once we have the handful of sand, the world of which we are conscious, a process of discrimination goes to work on it. This is the knife. We divide the sand into parts. This and that. Here and there. Black and white. Now and then. The discrimination is the division of the conscious universe into parts. The handful of sand looks uniform at first, but the longer we look at it the more diverse we find it to be. Each grain of sand is different. No two are alike. Some are similar in one way, some are similar in another way, and we can form the sand into separate piles on the basis of this similarity and dissimilarity. Shades of color in different piles - sizes in different piles - grain shapes in different piles - subtypes of grain shapes in different piles - grades of opacity in different piles - and so on, and on, and on. You&apos;d think the process of subdivision and classification would come to an end somewhere, but it doesn&apos;t. It just goes on and on. Classical understanding is concerned with the piles and the basis for sorting and interrelating them. Romantic understanding is directed toward the handful of sand before the sorting begins. Both are valid ways of looking at the world although irreconcilable with each other. What has become an urgent necessity is a way of looking at the world that does violence to neither of these two kinds of understanding and unites them into one. Such an understanding will not reject sand-sorting or contemplation of unsorted sand for its own sake. Such an understanding will instead seek to direct attention to the endless landscape from which the sand is taken. That is what Phædrus, the poor surgeon, was trying to do. When analytic thought, the knife, is applied to experience, something is always killed in the process. That is fairly well understood, at least in the arts. Mark Twain&apos;s experience comes to mind, in which, after he had mastered the analytic knowledge needed to pilot the Mississippi River, he discovered the river had lost its beauty. Something is always killed. But what is less noticed in the arts - something is always created too. And instead of just dwelling on what is killed it&apos;s important also to see what&apos;s created and to see the process as a kind of death-birth continuity that is neither good nor bad, but just is." Robert M. Pirsig - Zen and the art of motorcycle maintainance.